Mondesi's House: WILBON: "CROSBY MILES AHEAD OF OVECHKIN"
WILBON: "CROSBY MILES AHEAD OF OVECHKIN"
"Capitals fans might as well stop with the argument that Ovechkin is a better player; sure he is a bigger scorer and more entertaining player. But he can't get his team past Crosby's teams and they're undeniable rivals and will be for the length of their careers. Right now, Ovechkin would need a telescope to see Crosby, who's that far ahead in this race." 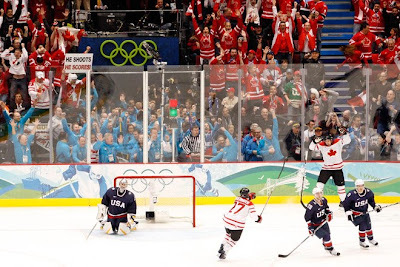 To recap the Olympic hockey experience one last time, here are the respective lasting images of Crosby and of Ovechkin. If Wilbon didn't already make your mind up, let these serve as the tiebreakers. Miles ahead? Comparing team accomplishments to determine the better individual player? Come on, I'm a Crosby fan and I agree that Crosby's the better all-around player, but maybe Wilbon should stick to basketball. maybe ovie needs more cream and clear with a side of red beans? I don't really get caught up in the comparisons although I think it's really a wash, but a column like that has got to have Caps fans howling. And I do get immense satisfaction in their suffering. Am I shallow for thinking this? Hell yes and I'm ok with that. Caps fans are collectively moronic. I think a lot of them are new to the sport and they don't have a great grasp of the game. They follow what they see on the ice and bench and take that as gospel. I have NEVER seen anybody complain as much as Boudreau. Every call he is whining, no matter how legit and/or obvious. Their players constantly take obvious dives, then look up at the refs for a call and if they don't get it, the fans boo en masse. I am not saying Pens fans don't whine and complain, but I think we can tell a dive when we see one. We did employ Jaromir Jagr for 10 years. 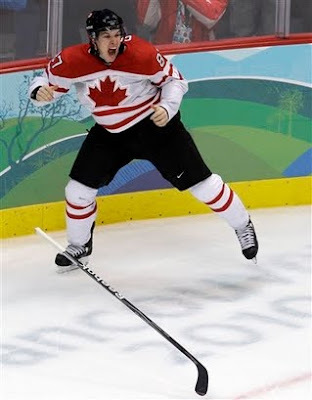 I'm finally over being pissed that we lost the gold medal game. I'm now just REALLY appreciating what Crosby accomplished Sunday, and being happy that (aside from the Olympics) he's on our side. I really like Wilbon, and definitely agree with him on this, but when he said on PTI that he thought that Crosby would get booed tonight, I could do nothing but just shake my head. Could not disagree more. Ovechkin's still clearly the better player. Their points per game averages aren't even in the same universe. Blaming Ovechkin for his team's failures is absurd. That would've been like blaming Lemieux early in his career for the Pens' failures. He's not the problem. It's all the losers around him. Remember, last year Crosby wasn't even the best player on his own team. And if he fails to score in OT of the gold medal game, he'd be getting vilified in Canada right now and being labeled a "choker" for going scoreless in the last 3 games. According to hockey reference.com, after five seasons both Crosby and Ovechkin's point per game average is 1.35. As for "if he fails...", he didn't. I think I'll save you further abuse and wish you well. I love reading the comments section on Wilbon's article. It goes on for days. I think Sid and Ovechkin both fit that description, don't you? For example, using team accomplishments to compare Max Talbot and Tom Poti doesn't work, but it does factor into Crosby/Ovechkin. I mean, it's not the only thing that matters, it does matter A LOT. What disappoints me is that, for the last 3 years, I really felt that this was a 3 man discussion with Sid/Ovie/Geno, but Malkin really needs to pick up the pace this year! He's having a good season by normal standards, but not by "Geno" standards. Perhaps that nagging shoulder thing from early in the year never really went away. And yes, Crosby excels at more facets of the game than Ovechkin does. But Ovechkin's lethal shot does help make up for what he doesn't do, and it helps a lot. I so disagree with that. Was Lemieux no good until 1991? Is Luongo a worse goalie than Osgood because he's never won a Cup? Nah. Individuals simply cannot be assessed by their teams' accomplishments. Championships are what separates good/great players and makes them legends. Was Lemieux a great player prior to 90-91? Of course he was. He didn't even get recongnition though until he won the 1987 Canada Cup. You can find arguments in every sport over who was better. Ted Williams and Joe DiMaggio. Dan Marino and Joe Montana. Wilt Chamberlain and Bill Russell. All great players. The difference, Championships. DiMaggio 10-0, Montana 4-0, Russell 11-2. Statistically, Williams, Marino and Chamberlain were superior, in fact vastly superior. Unfortunately they all played TEAM sports. In a team sport, the only statistic that truly matters is the number of rings you have!